I'm so excited to be offering our first community outreach with DLD. As part of the new Design a New Me aspect of my business, I am looking forward to giving customers a chance to learn new skills as well as give back to others in the process. I'd like to invite you to Daisy Lane Design's first Make and Donate. The remaining class of the summer will take you through the paces of making an infant bib. There will be two chances to attend this class: Wednesday, August 6, and Wednesday, August 13, from 6-9 pm. You can see the materials list on the classes page. The cost of the class is $35, and includes a DLD bib pattern, and 3 hours of instruction. DLD bib patterns include 2 pattern sizes, for both infants and toddlers. They encourage pairing complimentary fabrics so that your bib is reversible, and includes top stitching which gives the bib a very polished and finished off look. They also include a pearl snap for a secure fit and no velcro sticking in the wash. Both the DLD bib pattern and bibs are popular shop items and I think would be a super sweet gift for a new mom. They are my go-to gift for baby showers, and I was inspired to create them when my daughter was in bibs. 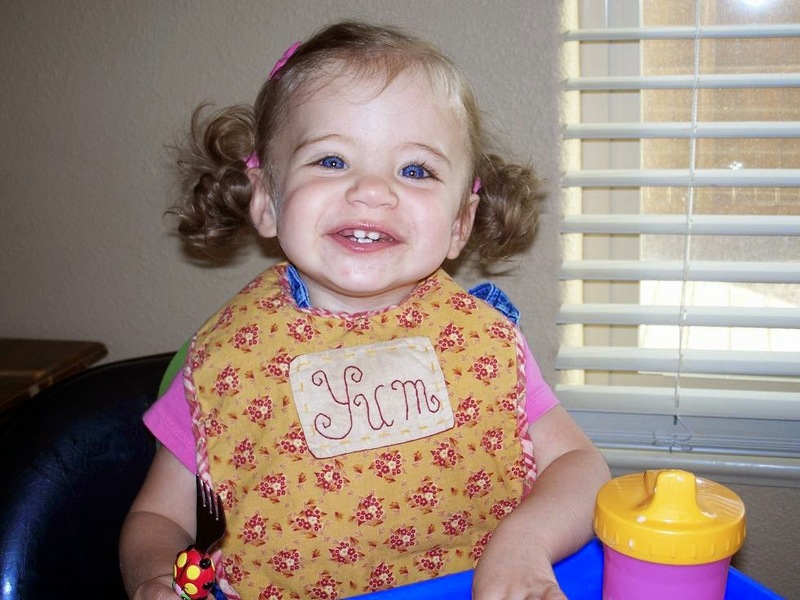 She used to escape from the store-bought bibs within seconds of putting them on! You have my full permission to use them for gift-giving as well as for selling them at craft shows or on your etsy shop. Just throw a shout out to DLD for the design and pattern and don't go around copying and selling the pattern, that's just mean. The world's greatest escape artist at 15 months. Bib class is a stand alone event that is great for anyone who is having a baby, has friends or family that are expecting, or for students that just want to expand their skill set. However, there are other reasons to attend. On Saturday, August 16, from 2:30-5:30pm, DLD will be hosting an "Open Sew and Donate" at Great Pacific Frame Shoppe in Pt. Pleasant, NJ. I will bring pre-cut bib pieces, batting and snaps, you bring your sewing machine, thread, notions and bits. Together, we will sew bibs that will then be donated to an area pregnancy center that accepts donations for new moms and babies. Hopefully, a handmade item will be an encouragement and comfort to both mom and baby! ing some snacks to "ease the pain" of spending the afternoon sewing with a bunch of other Crafty Betties. -You can attend a bib class without attending the Sew and Donate. -You can attend the Sew and Donate without attending the bib class, if you are an experienced sewer who feels they don't need the small group instruction and will be ready to jump in and crank out bibs. One last exciting addition: on the 16th, at the Open and Sew and Donate, DLD will be debuting its first set of sewing kits. Appropriately, the first offering will be bib kits. In each kit will be a selection of fabrics to make one bib, batting and pearl snaps. Patterns, if needed, will be available to purchase as well. I hope that the kits will both help reduce my ridiculous stash of fabrics as well as prove a convenient source of supplies for your sewing projects. I look forward to offering more as we go along! What a very great advocacy! Pairing complementary fabric is a good thing to learn, because reversible bibs are better than other bibs that only the front can be used. Great job and just keep it up! Thank you, Rob. :) Trying to make a little difference - even if just for one person. Hope we get some participants!